Recently the physics department here at Stony Brook University decided to have a photo / digital artwork competition. I think such competitions are a great idea, since it provides a way for physicists to express their passion for what they study in a way which people outside their field can understand. It also shows that art and physics are not incommensurate. In fact over the years I have met at least one or two very good artists who have pursued careers in both physics and art at the same time. To make this piece 1000 water molecules were placed randomly in a box at a density of 2 g/L, or about 1/500th the density of liquid water. Energy minimization was run to quench (rapidly cool) the system. A classical molecular dynamics simulation was run at 220 K (-53 C) for two nanoseconds. I then analyzed the trajectory using VMD (Visual Molecular Dynamics) and rendered two frames using POVray, a popular open source ray tracing program. I collected several interesting looking clusters into one image. The model used was the flexible extended simple point charge (SPC/E-f) model. The SPC/E model was optimized to reproduce the behaviour of water at 300 K and does not reproduce the phase diagram of water very well, yielding a freezing point of 215 K. Therefore, the results of this simulation show the behaviour of water at low density slightly above the freezing point of the model. This image was created by constraining four sodium (purple) and four chlorine (green) ions on a plane and then solvating them with around 600 water molecules. A classical molecular dynamics simulation was run at 280 K or 7 C (45 F) for twenty picoseconds. 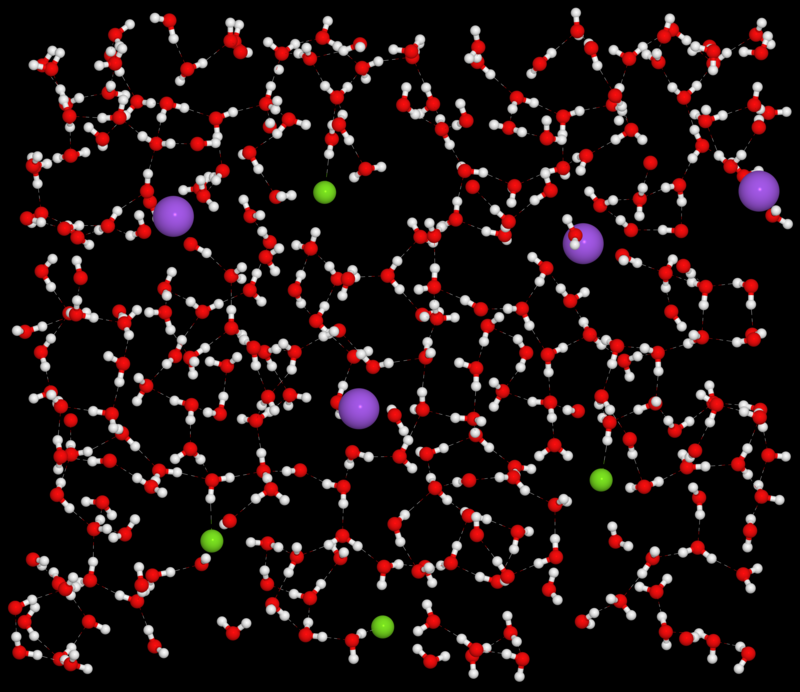 I then took a slice of the simulation box to show how the water molecules are coordinated around the ions. Hydrogen bonds are shown with dashed lines. I estimate that the concentration of salt shown in this picture is about 3-4 mol/L. NaCl saturates at 6.14 mol/L so the picture shows a realistic concentration. What I like about this image is that you can see how the water molecules coordinate themselves around the dissolved ions. The chlorine ions are negative, so the surrounding water molecules orient themselves so their hydrogens, which are positive, face the chlorine. Likewise the sodium ions are positive, so the water molecule’s oxygens face the chlorine. By orienting themselves in this manner, the water molecules block out the electric force of attraction which would normally pull the chlorine and sodium back together. This phenomena is known as dielectric screening, because the water molecules screen, or block, the electric force. The piece “condensation” won the photo contest in the digital artwork category. Expect to see it soon on permanent display in the physics building! Condensation is on permanent display in the physics building, across from the north entrance (the entrance near the elevators. For the 2014 photo contest I submitted an improved version of “Salt Water Matrix”. 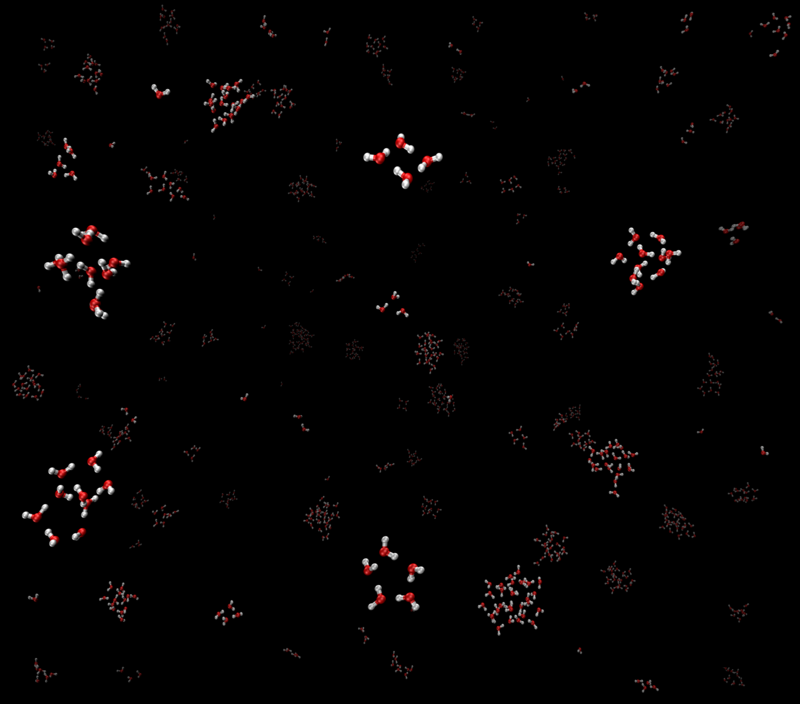 I made all of the hydrogen bonds much thicker (a process which took quite a bit of time), and I took some artistic license and moved some of the water molecules around and removed some of the overlapping ones.